We were delighted to be invited to the launch party of I Love Cheadle Hulme this week. 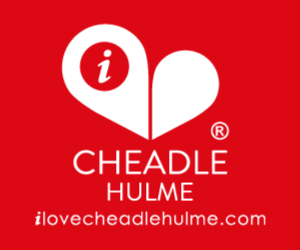 I Love Cheadle Hulme is all about promoting local shops and local businesses, as well as clubs, venues, groups and events. I Love Cheadle Hulme most certainly provides a vibrant and current go-to source of information for anyone and everyone who lives, works or plays in Cheadle Hulme and keeping Cheadle Hulme firmly on the map as a fabulous place to live, work, shop or play. Keeping good company, the Mayor & Mayoress of Stockport, Cheshire were also at the event, mingling with Cheadle Hulme’s best known businesses. From sole traders and network marketeers to local branches of national banks and estate agents it was a diverse and eclectic gathering. The launch party was a wonderful evening surrounded by the distinctive and statement I Love Cheadle Hulme balloons and logos. This spectacular launch party was held at Rainbow88 in the Cheadle Hulme shopping centre. We were delighted to be treated to a complimentary glass of fizz and some of Linda Lam’s delicious Rainbow88 snacks and nibbles, as well as being entertained by the King of Swing, Alan Burton. It was wonderful to chat to a huge variety of fellow local businesses who are all so proud to be based in Cheadle Hulme, some of whom we already deliver a consultancy service to, and we look forward to building new websites for the large number of new start-up businesses that were also in attendance. Looking across the Rainbow88 it was difficult not to feel a sense of pride at being involved with so many other local businesses and there is most definitely a real sense of excitement at what more is to come! Cheadle Hulme is not just a fantastic business location but also a great place to live.